Since we finished the butterflies, we have been busy making a couple of video game characters for an exciting new game! These guys are full size at 78" tall and made almost entirely from HDU! I can't post anything else about it until the NDA is up in March, but I have been documenting it as I go. We also have some pretty cool film props that also have an NDA, so I'll post them later as well. In the mean time, I thought I would do a helpful post on slicing 3d models, and getting the cnc to clean up the glue joints. There are a million reasons why you would want to slice some model parts on the router. One of the biggest for us, is that we are sometimes limited by available cutter lengths or material thicknesses. For example, when were cutting a model over 3.5" thick, but the available material only comes in 2". One way is to have Aspire slice the model, machine the parts separately, then glue them up. But then the seams require work to clean-up after. I much prefer letting our Techno do as much work as possible, because it does it faster and better than I ever could! So here's a 3d model replica I made of the Excel gum's bad breath coffee guy like in their commercials. First thing up is to slice the model into layers I can use. In order to overcome any material variances, I slice my model just a hair under the material thickness. In this case 1.95". This will let the cnc plane off .05" creating a dead flat surface to glue the 2nd layer of the model to. Here's our model, sliced at 1.95" thick, and the second layer turned off in Aspire. I had Aspire create a vector boundary around the whole 3d model slice, then offset it outwards just over the .250" ballnose diameter we'll be cutting this with. In this case, .300" This will limit the toolpath so we don't machine the whole 12" material block. At this point, it is important to add some small tabs to hold the model in place for the second layer machining. I simply drew some rectangles, and made the .250" thick. Make sure to set the tabs to "MERGE" or they'll pop out the model, looking weird. This should hold it while it cuts. So this is the roughing pass done with a .250" ballnose cutter. I'm a little lazy, so I usually rough and finish with the same size cutter to eliminate a manual toolchange. And the finishing path as well! 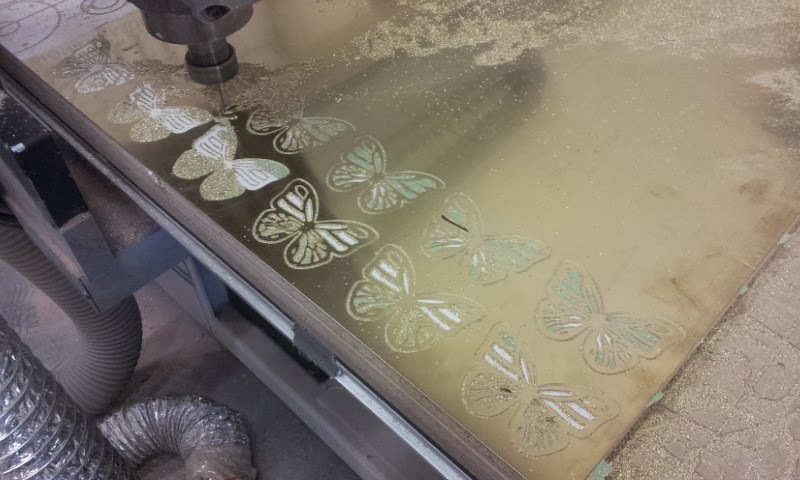 As long as you don't do a cutter change between the roughing and finishing pass, you can use the same vector boundary for the finish machining. Aspire calculates differently between an endmill or a ballnose, A ballnose gets calculated to the centre of the cutter, while an endmill calculates to the edge of the cutter. So if you plan on using different cutters, you'll have to adjust the vector boundary accordingly. The last portion of the "Bullets to Butterflies" exhibit were necklaces! 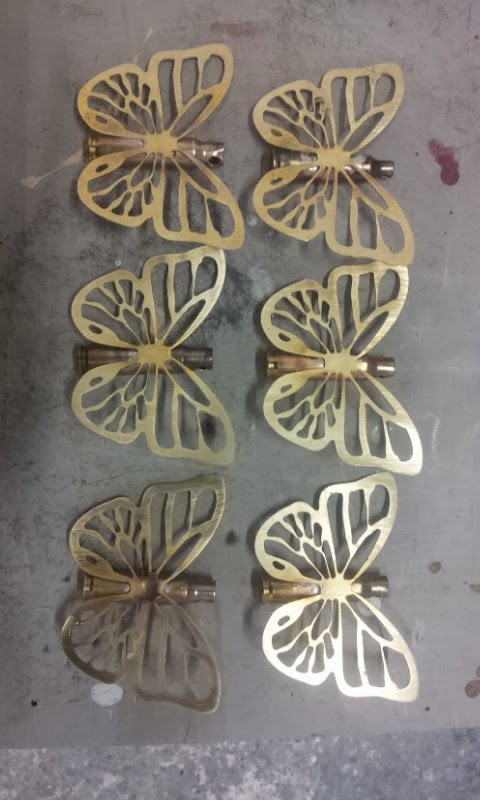 Saba, the artist, wanted us to fabricate butterflies from empty shell casings. 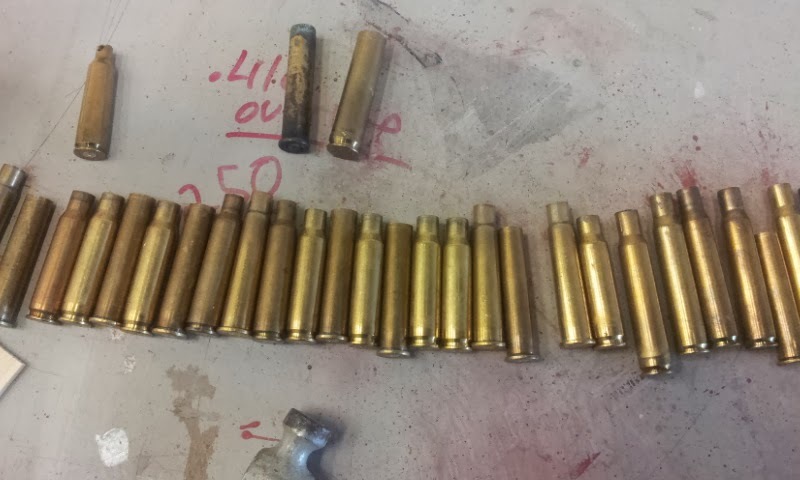 The empty casings were picked up from a local shooting range. I drew up a butterfly set of wings in Aspire, and nested and toolpathed them out on the sheet. We cut them from a sheet of .040 brass, using a tapered 1/16" ball nose cutter. I originally started with a 1/8" endmill, but it didn't quite get all the detail. I didn't want to chance my 1/16" endmill, so the tapered ballnose did the trick! The last thing to do was punch the hole for the chain in the bullet, and solder on the wings. Saba actually did the soldering, which was pretty funny on the first 2, but she quickly got the hang of it! We attended the local showing at the art gallery on Saturday, and the work by all three artists, Saba Syed, Huma Durrani, and Unaiza Karim was fabulous! It was a great afternoon for both Jody and I! What a week! Jody and I booked off for a super last minute vacation to Panama, which was killer HOT! Woo-Hoo! While we were away, a couple of things came up that were kinda cool. The first was finding out that our work is on the cover of both the 2013 and 2014 Sign Media Canada's Buyers guide! This is a great honor for us for sure! Special thanks to Peter Saunders for supplying the covers images to us! The second cool thing is that we'll be back in Bridgeton, Indiana on June 1st through the 3rd. teaching 3D modelling and routering. Unlike years past, this year will be just Jody and myself teaching. I will be covering the 3D end of things, and Jody will be teaching color theory and paint techniques. This will be pretty intense, depending on peoples skillset, but no-one will leave without a great handle on things! software calculates surface smoothing, and how to control it in your favour. be carried over to any other SDS modelling package, as they mostly all behave the same. everyone to work on their projects, and ask for quick one-on-one help. PC as the trial version software. real-world results as we pick the different strategies. easy! We'll also cover a few painting styles, from glazing, to dry-brushing and washes. move into the 3D world, or learn some new techniques. Hopefully we'll get to see you there!